Partisan cost increased from 210 to 250 to bring the unit in line with its cost. British Command Tank buffs change to the following because initial modifiers were currently over performing. Fixed an issue of rifleman sandbag not showing up. Crew/decrew using USF Radio Net ability will no longer stack reload times on all Sherman tanks. This flag was set to false in order to prevent flak weapons from instantly killing all squad members in garrison structures. Slight damage reduction in order to allow players to react to this unit. Previously at 20 damage the lethality rate of the Centaur was over performing. We are reducing the bonus damage that flamethrowers apply to garrison to give players more to react with their units in garrison. Previously we would see weapon teams be killed before they could ungarrison. We tuned vehicle flamethrowers to make them more consistent across the board. We have reduced the damage on most heavy flame vehicles because it was over performing while increasing the damage on the wasp due to its underperformance. We are increasing the time per tick for damage over time. This will include all incendiary abilities, Molotov’s, and flamer dots that vehicles leave behind. The tick in game time should translate to about 1 second real time which should help player gauge the amount of damage they will take if they choose to stand in the fire. Previously the huge blast radius of these bombs made it very difficult for players to dodge. We want to reduce the effectiveness of artillery shells against production buildings. In our effort to make AOE more consistent we saw a huge jump in performance with indirect fire units such as the LEIG and Pak Howtizer. We are adjusting its stats to bring it more in line with other indirect fire units. In our effort to make AOE more consistent we saw a huge jump in performance with indirect fire units such as the LEIG and Pak Howitzer. We are adjusting its stats to bring it more in line with other indirect fire units. We are addressing the heavy attrition costs that infantry sections have. We are reducing the overall DPS due to players not being able to react to these units when engaged in close quarters. Reducing the armor of the Churchill to allow reduce the amount of deflection while maintain the Churchill’s ability to soak up damage. We made some adjustments to Rifle Company to address the ongoing issue of mainline infantry having such a strong anti-garrison weapon. Another thing we wanted to address was the ability to break the intended pacing of veterancy. We have scaled up Rear echelons up slightly to reduce spam. Increased the requirement on rifleman vet to reflect their new current performance at veterancy level 3. Slight cost increase to reflect the unit’s performance. Slight adjustment to Infantry section making them slightly better at fighting out of cover but slightly reduced performance in cover. Also adding the PTRS profile to the Boys AT Rifle to not make it a DPS downgrade against infantry. We are adjusting the British Sniper’s veterancy ability and weapon to allow more counter play with light recon vehicles. Adding appropriate cost and research time to this ability. Allowing players to get this upgrade relatively at the same time as the LMG42. Removing this ability that allows players to manipulate their resource with no counter play involved. Updated squad plans on Guards Troops and captain squad to prevent unwanted movement. German Supply Drop zone plane comes in from longest path so that you can shoot down the plane now. Learn more about these new commanders in our Know Your Commanders blog post. * The Leaderboards are now accessible in-game via the Player Card and Automatch lobby. * Your leaderboard level and level icon are now displayed on your Player Card as well. In addition, you can now also check your recent stats on your Player Card for info such as your Recent Match History and W/L ratio per time. * Specifically better pathfinding when moving a unit backwards (better reversing behavior). To learn more about the reasoning and design decisions behind these changes, check out our OKW Revamp blog. The buildable units, abilities and costs in the OKW's Headquarter structures have been altered. 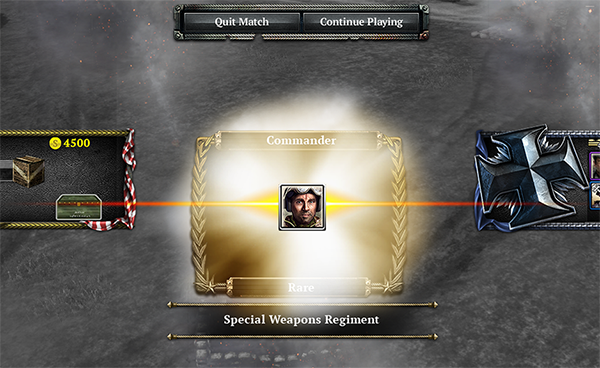 Removing the Elite Troops ability from the commander tree as it interferes with the general pacing of unit veterancy. Removing the Redistribute ability that allows players to manipulate their resource with no counter play involved. 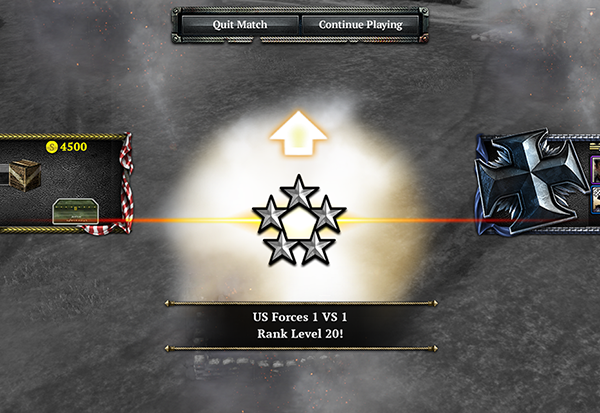 Removing the veterancy bonus from the ability as it interfere with the general pacing of unit veterancy. * Ease of life change. We have scaled up Rear Echelon Troops slightly to reduce spam. Increased the requirement on rifleman veterancy to reflect their new current performance at veterancy level 3. Usability improvement change. Reduce infantry sniping. Slight adjustment to Infantry section making them slightly better at fighting out of cover but slightly decreased performance in cover. Also adding the PTRS profile to the Boys AT Rifle to not make it a DPS downgrade against infantry. * Adding appropriate cost and research time to this ability. Increasing its cost to reflect the unit’s performance. Cost alignment with its performance. Reducing Command Point requirement to bring the pacing in line with other light tanks. Removing the Soviet Industry ability that allows players to manipulate their resource with no counter play involved. Bringing this unit in line with other heavy vehicles. After analyzing play data from the weekend we saw an increase in early tank usage for the Oberkommando West. We are releasing a targeted change to directly reduce that usage and to bring the OKW on par with the other four factions. We have adjusted the squad and entity population values of infantry. This will allow all infantry to retain their previous population value pre-patch without the use of decimal values. Previously having decimal population values would cause issues with call-in units. This is now resolved. All infantry entities will now have a population of 1 with the difference added onto their squad population extension. Updating modding wiki with info on curated mod types. We are reverting a change from the previous update which reduced the durability of Infantry Sections. This will bring Infantry Sections in line with their cost. Small buff to UKF intended to bring faction in line with the other four factions in 1v1. * Fix to prevent HQ cancellation exploit to get cheap units. The highly anticipated February Updates is scheduled to be released on February 25th and will include two new British Commanders, a multitude of bug fixes, a variety of balance changes based on feedback from the community, updates to pathfinding and more. Check out all the changes in more detail below. You can read more about these commanders in our Know Your Commanders blog post. We have added a “Historical Skins” On/Off Option to the Graphics Tab. This Option is for Users who don’t want to see non historical skins such as the blood soaked Make War not Love Skins. We would like to add more risk associated the abandoned function. Now in order to successfully retrieve an abandoned vehicle you will need to repair it to 100% HP. * Forced Facing before moving when executing the following commands added: attack move, facing command, right clicking on an enemy unit, and when moving a group of vehicles. We wanted to dial back this ability as it was over performing and created frustrating experiences to the receiving player. We are reducing the number of salvos by 1 to prevent the one-shot killing of OKW Base Structures. Previously we wanted to improve the AEC’s role to better combat infantry. However the way in which it was implemented resulted in the AEC over performing against its very own counters. We are reverting the main gun profile change and implementing a buff to its coaxial machine gun. This will now increase the AEC performance against infantry while maintaining its previous combat relationships. We are reducing the amount of rockets fired per barrage to help reduce potential squad deaths. We are also removing the Calliope’s ability to de-crew to prevent players from artificially decreasing their upkeep while their barrage is on cooldown. Reducing the damage profile slightly at far and medium range to prevent squad deaths in that area. We are increasing the HP of the 222 to allow it to better combat other light vehicles and infantry. The Stuart's "Point Blank Engine Shot" & "Shell Shock" can no longer be used at the same time. Fixed issue where Dropped Team Weapons would become unusable if the Weapon was dropped by a Stunned, Retreating Squad. Fixed issue where two Shock Troop Squad members would move to cover before they will start shooting. Stormtrooper ability renamed to Detection (from Vehicle Detection), Icon for ability changed to reflect name. Matchmaking improvements have been made to help ensure match-ups between players of similar skill are made on a more regular and consistent basis. As a result of these changes, automatch wait times may slightly increase. Fixed issue where Loitering Stuka and IL-2 Planes could attack long after the ability had ended. Fixed issue that was not allowing Users to update their Mod. Fixed an issue where ISG crew members were given excessive doses of D-IX. Addressed several minor bugs and did some housecleaning regarding data related to veterancy (including fixing the community highlighted issues with AT guns and the MG34). This patch was implemented to address some major bugs in Ardennes Assault as well as some issues in matchmaking. A larger update is scheduled for later this month. Fixed issue in Ardennes Assault with several upgrades not functioning correctly. Fixed issue with Automatch to reduce wait times in certain circumstances. Fixed exploit that allowed players to equip items that weren’t for their faction. We felt the Maxim HMG was overperforming in the early game due to its fast set-up. We also made adjustments to its build time and cost so it takes longer to reach the field and so it doesnt replace mainline infantry. Set-up from 1.5 to 2. Build-time from 24 seconds to 28 seconds. Cost from 240 manpower to 260. We have decided to reduce the durability bonuses this upgrade provides. We have also decided to increase the time it takes Infantry Section to build these Emplacements since they are not dedicated builders. Infantry Section now take 30 seconds longer to build Emplacements and the Forward Assembly. Improved Fortification upgrade now increases max health by 20% and armor by 10. Changed from increase in max health by 30% and armor by 40. 10 Warpaint Competition skin sets have been added to the game and will be available to purchase from the in game store as of April 21st at 10:00 AM PDT. 30% of the proceeds from these skins go directly to the creators while an additional 20% is funneled back into funding COH2 tournament prize pools and community events to keep the game alive and well. The first tournament to be funded by the sale of these skins sets will begin early this Summer! Balance updates to maps Hamlet and Crossroads by respective community map makers. Additional speech calls for Land Mattress unit. Animator fixes to the T70 and the 222 scout car. Normalized pop-cap on 120 mortar team. Fixed a bug with hold fire not being passed to reinforcements correctly in every case. Shock Troop's RG-42 Grenade now damages buildings and does full damage to units inside buildings. Fixed a hotkey issue on airlanding officer. Fixed an issue with the comet tank projectiles. Next week we will be launching a Balance Preview Mod that includes a variety of balance changes based on feedback from the community. Stay tuned for release notes regarding this mod coming later this week. In early May we will be running an Open Beta for all those who are interested in testing out and giving feedback on the pending changes to the current War Spoils system. The main goal of this beta will be to stress-test this system in order to find any remaining bugs and to gather feedback regarding any potential last minute tweaks to the system that can be made. Hide decals option added to graphics options. This hides all vehicle decals on the players local PC even if they are equipped. Useful for players with highly detailed skins or skins that include markings. A minor update has been applied to fix an issue in Ardennes Assault and provide support for the upcoming balance preview mod. AA rewards are now granted correctly in all situations. Support for several icons to be used by future balance mods. 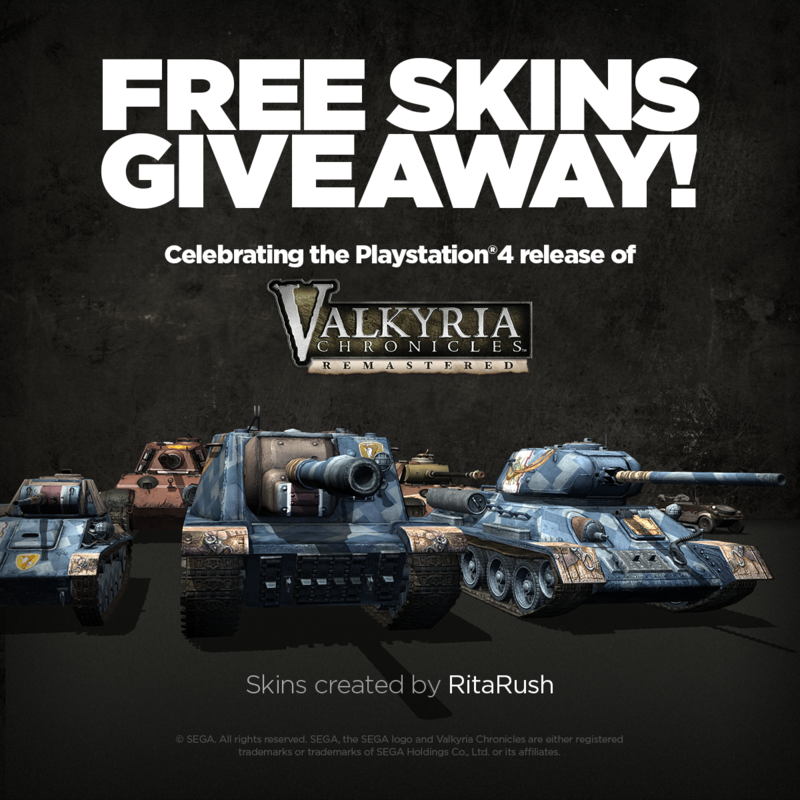 Two new Valkyria Chronicles-themed skins sets for the Soviet and the OKW factions will be given to everyone who logs in on May 17th (and to anyone who logs in the 30 days after) for free, to celebrate the release of Valkyria Chronicles Remastered on PS4. You can now submit Decals and Faceplates to the Curated Pathway in the Steam Workshop for a chance to have these items integrated into the live game and used in Automatch. A Skin Preview Image tool is now available in the Steam Workshop. Created by Janne252 - this tool allows skin modders to quickly generate high quality, standardized skin preview renders using the game. Fixed a bug that blocked any race being chosen as an AI opponent (previously, if you didn't own the race you couldn't play against it in matches against AI). Firstly the system will no longer drop duplicate items. Additionally, you now only receive items for factions that you own (Prior to this update drops were biased towards the currently played army but were possible for all armies.). You may now also receive a new currency called Supply as a Warspoils drop. You can use Supply to buy items from the in game store such as bulletins, skins, or commanders. You can tell exactly when you will get your next reward from the loot bar which is shown in the player card. Each game you play you will receive 1500 points. 500 Bonus Points are awarded to the match winners. Once you have 6000 loot points you’ll get a loot drop that will contain a random item from an army you own, or an amount of Supply. You can now purchase Intel Bulletins, Victory Strikes, and Decals from the in game store using Supply. Simply go to the items tab and select the category you are interested in. There is a drop down filter so you can easily browse bulletins of the type you are interested in. You can also use the search feature to find what you are looking for. Players can have only 1 type of any item equipped in a single loadout now. This is mostly in reference to Intel Bulletin stacking since players now have quick and easy access to the entire bulletin set via the in game store. You will have the option to convert all your existing duplicates into Supply from the Inventory Screen. Simply select Show Salvageable Items and then click the Salvage All button. 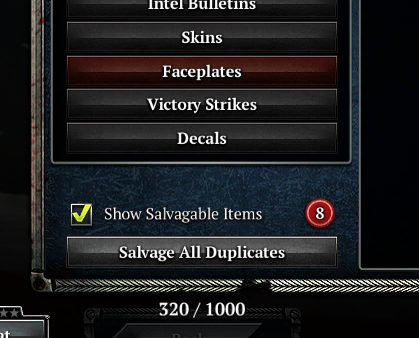 Optionally, you can also salvage your duplicates one by one by right clicking on a duplicate and clicking "Salvage". All duplicates are salvaged at 500 Supply each. This was done because we want to reward the time players invested into the game over how lucky they may have been. Indeed, while the number of items you ended up getting is a direct function of time / how much you have played, the nature of those items that dropped was really purely random – and it will still mostly be this way after the update (we will just ensure you don’t get drops for factions you don’t own). Therefore, how many commanders you may have gotten out of playing the game compared to another player, for instance, is really just the result of sheer luck. On the opposite, the number of items you ended up accumulating overall compared to another player is the direct result of your difference in commitment to playing the game on a regular basis – which is what we want to reward you for. A new validation system is in place to make sure that only players who play a fair game receive Loot Points after a match. This is – you won’t get loot points if you go AFK or don't significantly contribute to a game. 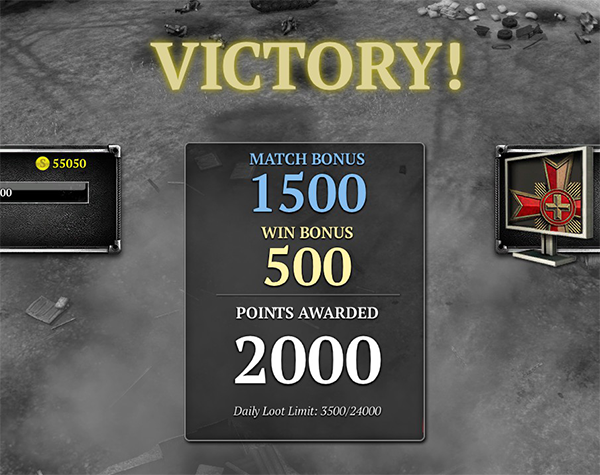 A daily Loot Point Limit (24,000 Loot Points or 12 wins) has been applied to modded games to help minimize War Spoils farming. If you increase your leaderboard level after an automatch game there is now a post game acknowledgement to celebrate! We’ve redone the Map select screen so that maps can be filtered and displayed by game type and ordered alphabetically. This makes it much easier to find the maps your looking for. A quick shoutout to "miragefla" for his contribution to this Balance Update and everyone that participated and gave feedback during the Balance Preview. In order to add to CoH2’s current strategic diversity, the changes outlined below are designed to Increase the depth within factions by improving unit viability, creating diverse options for build orders and bringing factions in line with one another. This will create more diverse and viable strategies for players at a variety of different skill levels. There currently are a variety of gameplay outcomes that do match player expectations which is creating a degree of frustration within the player base. A number of the changes outlined below attempt to address this by matching these outcomes to acceptable expectations such as through the removal of “bad” RNG and balancing specific units/abilities' cost vs reward that are currently out of tune. Developer Comments: We felt the risk associated with flanking a Heavy Armored Vehicle was much too great because of the high rear armor. To help balance this risk vs reward we are reducing rear armor on all heavy armor across the board. Developer Comments: We often saw mines wipe full health squads when planted in front of building entry points or cripple enemy vehicles. We also tried in the Balance Preview trying to reduce the damage of mines to deal with this issue but it made mines feel very underwhelming. We wanted the keep the satisfaction of some casualties without the squad wipes, thus we have ensured mines kill some models in a squad but not wipe the entire squad out completely. We are also removing all engine destroy and Tread Breaking Criticals from all mines. These changes will bring the reward of an enemy unit hitting a mine in line with the cost of placing it. All other general purpose mines do damage to a maximum of 2 member in a squad. Engine destroy and Tread Break Criticals removed from all mines. Developer Comments: We feel engine damage should always be caused by explicit actions and not randomly through a critical table. We are removing random engine criticals from occurring above 5% health. Engine damage now only occur above 5% health from mines, and from specific abilities that always cause engine damage. Developer Comments: We felt it was too easy to charge into suppressive fire and simply throw a grenade to knock out a HMG team. This was not an intended counter and thus suppression will now reduce the range of grenade abilities. All grenade abilities that are not snares have their range reduced by 33% when the unit is suppressed. Developer Comments: To alleviate the effects of some frustrating RNG from anti-tank weapons firing on infantry squads, we have decided to reduce the damage these weapons deal to infantry to prevent snipes on full health models. Damage set to deal only 25% against infantry. Developer Comments: We felt Snipers, even when caught out of position, felt too durable. We also wanted to standardize all sniper rifles to use the maximum amount of time for aim-time and cooldown. These weapons will no longer fire faster the closer the squad approaches them. Target size from 1 to 1.15. Cooldown, and all aim-time always uses the max amount of time and has been standardized for all distances meaning snipers do not fire more quickly the closer the target is. Developer Comments: Some heavy armored vehicles had an extremely rare critical that could stun enemy vehicles on deflection. We feel this is frustrating RNG and should be removed from the game. Developer Comments: We felt by allowing smaller team weapons and core infantry to spawn from corresponding base buildings, it could slightly speed up initial engagements, and allow for more meaningful base placements for Soviets , Wehrmacht, and OKW factions. All Core Infantry Squads and Core Small Weapon Teams now spawn from its corresponding building rather than from Off-Map. Developer Comments: Team weapon gunners will have the lowest priority to get targeted. Players can still attack the gunner first if they manually target that entity but automatically they will always target the gunner last. We are hoping this will help with the death loops where weapon teams constantly try to man their team weapons as they retreat. Artillery Production Inow builds BM-13 Katyushas and Panzerwerfers 50% faster. Artillery Production II now builds ML-20 152mm Gun-Howitzers and leFH 18 Artillery 50% faster. Developer Comments: We felt the T-34/76 was under performing and needed some improvements to help deal with infantry. Hull Machine gun burst duration changed from 2/1 to 2/2. Coaxial Machine gun burst duration changed from 3/2 to 3/3. Main gun reload from 6.2/6.8 to 6.1. Developer Comments: We saw that the Soviets had to rely on Doctrines or would have a difficult time dealing with heavy armored vehicles. We wanted slightly improve the SU-85 to be stronger against heavy armored vehicles while being slightly weaker against flanking vehicles. Reload increased from 3.8/4.2 to 5.4. Cost increases from 340 manpower and 120 fuel to 350 manpower and 130 fuel. Veterancy two -30% reload modifier replaced with +30% weapon penetration modifier. Developer Comments: Modified to put it in line with other vehicles and slight boost to its penetration to help it better engage heavier armor. Scatter offset adjusted to match other vehicles. Developer Comments: Adjusted the mine to prevent one-hit kills at full health. Mainly done to prevent squad wipes of units leaving buildings. Plant time was lowered and the mine now deals damage to compensate. Damage from 20 to 80. Developer Comments: The Soviet Sniper had the lowest health amongst all the Snipers. Because we are increasing the unit size of all Snipers, we have made adjustment to the health the Soviet Sniper to compensate. Developer Comments: This ability's current wind up time made it feel unresponsive, thus we have reduced its wind up time alleviate this issue. Developer Comments: Due to the lack of anti-tank in the Special Rifle Command, we are giving Penal Battalions a more focused roll as a dedicated anti-infantry unit. SVT damage from 8 to 10. Squad cost increased to 300 manpower from 270 manpower. Reinforce time from 4.5 to 5.4. Build time from 27 to 32 seconds. "Tripwire Flare" changed to "To The Last Man!" This ability is a passive that increases the power of the squad as they lose members. Modifiers are +4% accuracy, -2% weapon cooldown and -3% received accuracy per member lost. Developer Comments: In order to bring the 57mm AT Gun in line with other AT Guns from other factions in the same Tier, we have increased the base penetration to improve performance when not using AP rounds. Take Aim shifted to a timed ability to reflect its power. Accuracy changed to match other anti-tank guns. Take Aim! now a timed ability. 20 seconds, 60 second recharge. Developer Comments: Increased penetration to make it a more viable soft counter to light vehicles as well as more distinct from other HMGs due to its later timing. We also wanted to give the lieutenant tier a deterrent against light vehicles without needing to invest in bazookas. Bonus penetration against specific vehicles to ensure the .50cal can harm these vehicles, but not burst down other light vehicles immediately. M2HB .50cal HMG penetration from 3/2/1 to 7/6/5. New Ability: Armored Piercing Rounds - Timed ability that loads AP rounds for 25% increased damage and +10 pentration. Developer Comments: Increased LOS to allow the M36 to better kite, locate and hunt enemy armor without boosting its firepower any further. Developer Comments: We felt the M8 HMC was under-performing and needed a slight stat boost to improve survivability and effectiveness. The AOE drop-off for the mid-far range was lessened to improve the M8's damage output against troop targets when its shells do not land direct hits. The damage drop-off was incredibly harsh given that the mid-range of the shells are set to 2 meters. Build-time from 80 seconds to 50 seconds. Health from 320 to 400. Developer Comments: We have significantly boosted the artillery ability in power and lowered cost to give USF some form of non-doctrinal artillery to help break concentrations of enemy units and structures. Recharge time increased to compensate and match other artillery units. Shells increased from 3 to 6. Time delay between shells set to 2 for maximum and minimum. Veterancy 2 Shells increased from 5 to 9 Veterancy 2 time delay between shells set to 1.75 for maximum and minimum. Artillery cost reduced to 60 munitions from 120 munitions. Recharge time from 60 seconds to 90. Range reduced from 85 to 60. Developer Comments: The Captain squad gave USF a very easy access to light Anti-Tank and made the Captain the most valuable officer in the game. We removed the Bazookas on the Captain squad to allow for light vehicle play to be more effective. On Me! no longer provides suppression resistance to prevent negation of MGs or suppression based platforms, but will break suppression making it ideal for getting units out of suppression or beaking pin status. On Me! No longer provides suppression immunity for its duration, but will still break suppression. No longer affects Team Weapons. Developer Comments: We wanted to give USF more means to counter garrisons without grenades and a mobile smoke platform as well as diversify their opening. Developer Comments: We are adding a hold fire toggle button so the Sherman Bulldozer doesn’t fire at units when not intended. Developer Comments: We made some slight adjustments to the Flamethrower aim times to allow for the vehicle to be better at kiting, reduced the cost to make it more affordable and in line with its performance. We have also reduced the garrison damage to avoid the vehicle instantly wiping garrisoned squads. Flamethrower damage versus garrison from 1.25 to 1. Veterancy 3 cooldown bonuses now benefits the Flamethrowers. Developer Comments: We felt the Support Armour Korp was slightly too expensive in comparison to other faction Tier 3 and needed a slight reduction in terms of cost to make the tier more affordable. Price from 260 manpower and 75 fuel to 240 manpower and 60 fuel. Developer Comments: Due to its clunky movement, the Brummbar would often get blocked against world objects. We decided to give this vehicle Heavy Crush to improve pathfinding and make it more maneuverable. Reload time standardized to make it more consistent and AOE has been adjusted to improve consistency as the damage quickly drops off by 2 meters. To adjust for these changes. Resource costs have been updated to bring it in line with its current performance. Reload standardized from 7.5/9 seconds to 8.25. Medium crush changed to Heavy Crush. Developer Comments: We felt the Heavy Panzer Korp was slightly too expensive given the price of the high cost units it currently houses. Cost reduced from 260 manpower and 75 fuel to 200 manpower and 50 fuel. Developer Comments: The Panzer IV Command Tank was much too durable because it benefitted from its own aura. To make it more vulnerable, the tank will no longer receive a defense buff from its aura. No longer receives benefits from its own aura. Developer Comments: Even though the Wehrmacht can build a trench, this is not as flexible as other forms of heavy cover such as sandbags. To increase the faction's heavy cover options, Pioneers have now been given the ability to build sandbags. Developer Comments: We felt that Bundled Grenades have been under-performing and not meeting their original design intentions. To bump up their performance we have made the following changes. Developer Comments: This change was driven from a popular idea that was expressed by the community. Battlegroup HQ no longer comes with Medics but must upgrade to get them. Due to OKW now having full resource income and to bring this ability in line with other factions, this upgrade costs a small amount of fuel. Medics must now be purchased as an upgrade. Cost 100 manpower and 15 Fuel. Developer Comments: This change was driven from a popular idea that was expressed by the community. Mechanized HQ no longer comes with Repair Pioneers but must upgrade to get them. Due to OKW now having full resource income and to bring this ability in line with other factions, this upgrade costs a small amount of fuel. Repair Pioneers must now be purchased as an upgrade. Cost 100 manpower and 15 Fuel. Developer Comments: This change was driven from a popular idea that was expressed by the community. In an attempt to break up the Volksgrenadier blobbing we are removing the Panzershrek upgrade. This has been replaced by a package that improves their AI at short-mid range whilst still maintaining some anti-tank to deal with armor that rushes behind ATGs or other units. While the upgrade is not that powerful to start off with, they do gain considerable power as the Volks gain veterancy which has many offensive boosts. Added StG 44 Package. Grants the squad two StG 44s that improve short-mid range combat for 60 munitions. Developer Comments: This change was driven from a popular idea that was expressed by the community. Community has voiced their opinion that they feel the OKW needs a suppression platform to deal with enemy blobs but also to have additional options other than always blobbing more Volksgrenadiers. To address this we have raised the MG 34s accuracy to improve its damage output against targets at range and reduced its cooldown to improve damage output at engaging multiple targets. MG-34s are now standard in the OKW arsenal. Available in the H.Q but requires a Battle Group H.Q or Mechanized H.Q. Developer Comments: We felt the damage output from a Goliath against an emplacement was too small. It’s a high investment, high risk unit and we feel it should pay off if it manages to reach its target. Developer Comments: We felt the Raketenwerfer was a little too easy to flank with vehicles once revealed. We are increasing the firing arc slightly to help address this issue. Developer Comments: With the removal of the Panzershreck package from the Volksgrenadiers we are happy to see how the OKW is currently playing. We do however notice the OKW struggle against armor if they are not ahead in resources. We are giving the Panzershreck package to the Sturmpioneers to help deal with this issue. Removing a critical that abandons the Sturmtiger at 50% health when damaged. Developer Comments: The British early game can often be very difficult due to the high cost of their Infantry. We increased the starting manpower to match other factions and to somewhat compensate their early game for their high manpower cost per unit. Developer Comments: We felt the Universal Carrier wasn't a viable option and felt we needed to make some adjustments. We gave it self-repair on stock so it no longer requires an engineer to be repaired, made it more durable through an upgrade purchase, and made significant improvements to the Vickers K.
Burst duration and rate of fire standardized to 1 at all ranges for Vickers K.
Health improved by 40 when upgraded with Vickers K or Flame Projector. Developer Comments: We felt the Counter Battery's cost vs reward was not well balanced and required tuning to bring it in line with other similar artillery options. We also want players to make decisive gameplay decisions where using this ability had virtually no risk associated with it. Is now a timed ability. Lasts 45 seconds and recharge time is 90 seconds. Developer Comments: Based off its effectiveness, we felt this unit could be called in too early. To help bring it in line with other Doctrine artillery we have increased its required CP. The White Phosphorus rounds was precision striking weapon teams too easily due to their low scatter values. Developer Comments: We feel the Sexton is one of the UKF's most underperforming units. Therefore, to improve the Sexton's performance we have increased the unit's AOE damage, increased the number of shells it fires, and made it fire a little faster. Developer Comments: We felt the reload on the main gun was hurting the unit's performance and the Tulip Rocket ability's role was redundant with the tank's main gun. To compensate for this we have reduced the reload time on the main gun and changed the role of the Tulip Rocket to be a temporary snare. Reload from 10 seconds to 8. Tulip Rockets now deal 120 damage from 240. Tulip Rocket ability cost from 100 to 80. Tulip Recharge time from 120 to 80. Developer Comments: Due to the extremely short range of Artillery flares, a unit often put themselves at high risk when trying to use this ability. To bring its cost vs reward more in tune, we have added a slight increase to the range of this ability so it can be used slightly further away from the intended target. Infantry Sections also accrued Veterancy faster than any other core infantry unit so we have slightly increased the Veterancy requirements for these units. Veterancy requirements from 480/960/1920 to 560/1120/2240. Developer Comments: The damage from the HEAT Grenade was under performing and we wanted to bring it in line with all other infantry anti-tank abilities. Heat Grenade damage from 50 to 100. Developer Comments: Due to the short range of Artillery flares, a unit often put themselves at high risk when trying to use this ability. To bring its cost vs reward more in tune, we have added a slight increase to the range of this ability so it can be used slightly further away from the intended target. • Artillery flare range increased from 30 to 35. Developer Comments: The Size of the Cromwell was smaller than other Medium Tanks. We are slightly increasing its size value to match other Medium Tanks. Developer Comments: We felt the Churchill costs too much for its current performance so we are reducing its cost. Cost reduced from 540 Manpower and 180 Fuel to 490 Manpower and 160 Fuel. Fixed a bug where the Vet 1 weapon reload modifier on the Royal Engineers was applying to all weapons. It now only applies to the Stens. Don’t step on the Grass Intel Bulletin now properly reduces the cost of Teller Mines. Fixed a bug that made LMG 34 that was picked up have different stats than the LMG 34 that was dropped.